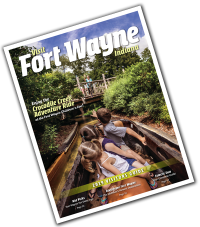 The Fort Wayne Visitors Center is celebrating Tourism Week and Visit Indiana Week May 6-12 with exceptional deals and special events! Biaggi&apos;s will be offering a free dessert with purchase. See details. Buy one admission, get one free at the History Center. See details. Hop River Brewing Company will be offering $1 off pints. See details. Visit our Open House from 11 am – 4 pm. Spin the wheel to win prizes, enjoy treats and discounts. Join us on Mother’s Day from 11 am – 5 pm for 20% off all purchases, plus special treats for mom. *To redeem this offer, simply stop into the Visitors Center (located at 927 S. Harrison in downtown Fort Wayne) between 8 am – 5 pm on the day above.